Happy Labor Day Weekend! It’s been a while, folks. And I’m sorry for that. But let me explain. In the last three months we have bought a house, sold a house, become a married couple, gone to Alaska on a honeymoon, and started to tackle a lifetime of projects on the 1870 farmhouse we moved to. And through it all, my belly has grown bigger and bigger (and along with it my emotions) as we prepare for the arrival of our first little one at the beginning of November. If I tried to take on anything else, I think you could just assume I’ve gone clinically insane. And through it all, meals must be made and eaten, day in and day out. In fact, I’ve eaten a lot more and a lot more frequently as the months of pregnancy pass. But have I been stopping to snap photos, write recipes, and post about it? Not so much. When you have to eat every couple of hours, planning for, preparing, and packing food can start to feel like a chore rather than a passion. Every once in a while though, I come across a dish that just hits all the cravings just right. This dish is one of them. 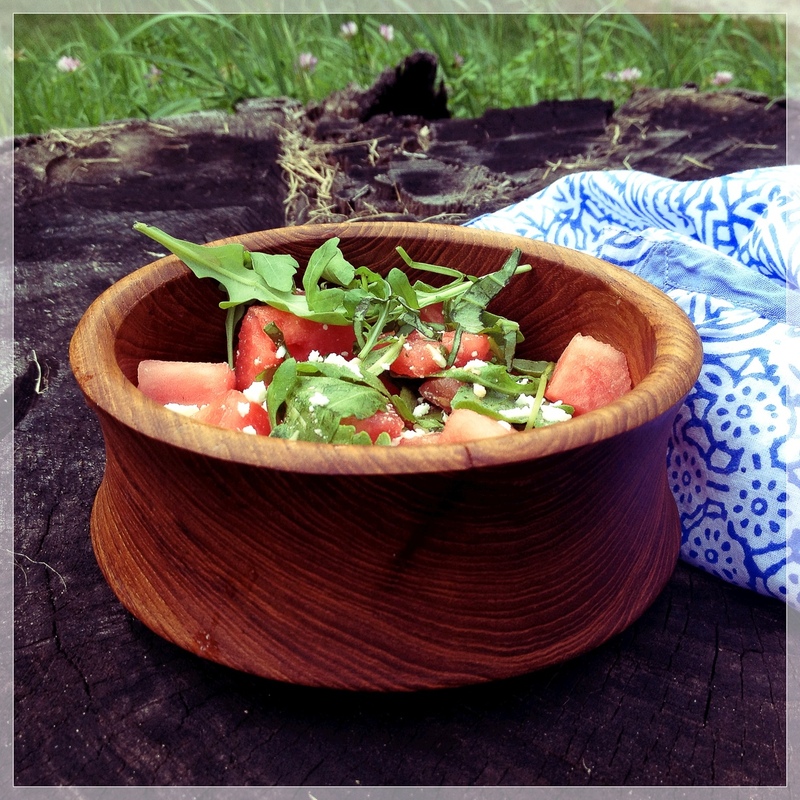 Juicy watermelon, tangy feta, cooling cucumber, and peppery arugula drizzled with lime, honey, and vinegar. Sounds weird, right? Trust me on this one, take hold of the last bits of summer, and enjoy this salad. If you are looking for last minute inspiration for salads to add to your Labor Day picnics, check out Cooking Light Magazine’s List of Great Summer Salads. 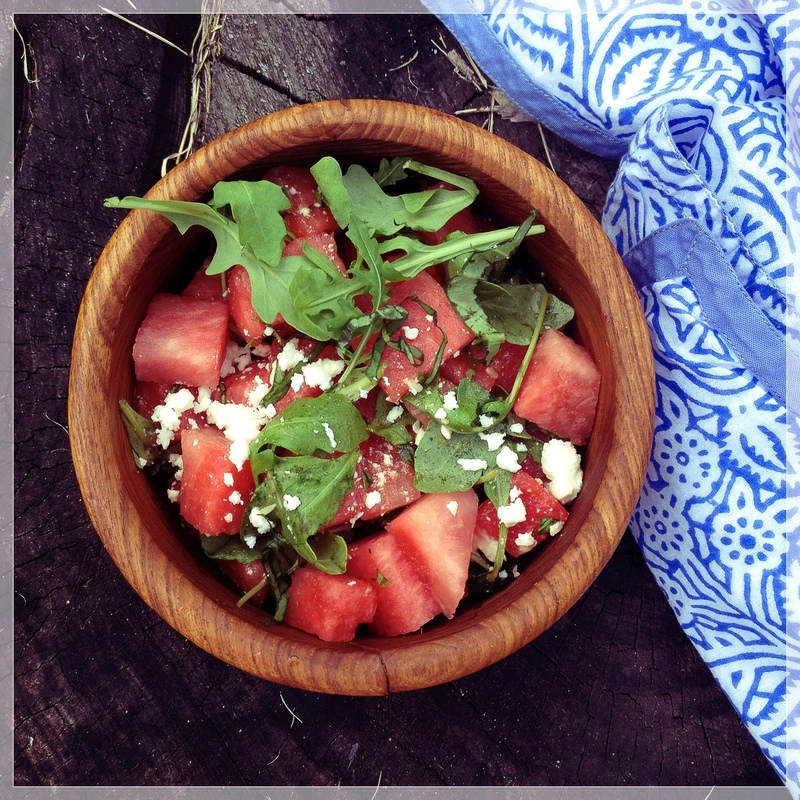 In addition to their own version of watermelon and cucumber salad, you’ll find 35 other beautiful, simple salads to fill your picnic table and lighten your barbecue. Ahhhh…it’s good to be back. Add cubed watermelon to a large bowl and gently mix in all ingredients through lime juice. Gently toss with half of the feta and crumble the rest on top. If adding white balsamic vinegar and honey, mix the two together with a fork or tiny whisk before drizzling on salad. Serve immediately! This salad, like many salads, do not hold up well overnight in the fridge.